Energy in all forms affects the profile of a country. The technological, industrial and economic scenarios of the country are directly affected by the generation and consumption of energy in the country. Energy thus has a major impact on the cultural and social growth of a nation. It can very well be concluded that ‘ENERGY’ affects the ‘development quotient’ of a country. India is home to about 17% population of the world, all residing on just 3% of the total landmass of the planet. Also, India is the third largest consumer of energy. But still, the per capita consumption of energy is very low. This is one of the reasons why India is still counted as a ‘developing’ nation. Let us now get to know the energy scenario in India. We know that there are two types of sources of energy- conventional and non-conventional. The conventional sources including the fossil fuels-coal, natural gas, oils, etc. and the non-conventional including solar, wind, geothermal, etc. The graph shows the contribution of the various sources to generation of energy in the country. 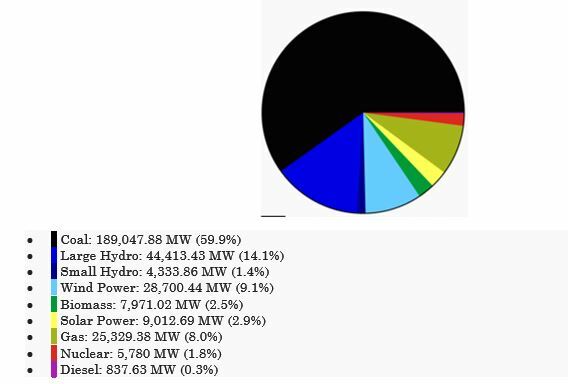 Most of the energy requirements of India are fulfilled by conventional energy sources, mostly, coal (about 60%). But can this keep going? Let us consider a case. To start a business, one of the most important requirements is the ‘capital’. Say we have invested a capital and started a business. Now we require more allowances to keep the business running, expanding it and for other miscellaneous expenses. Can the previously invested capital be used to meet these expenses? No. We need other sources because the capital cannot be available forever. It will finish up at a point and the business will then shut down! Similarly, the available conventional source, coal, is analogous to the ‘Capital’. If we continue extracting it, it will end up at a point, severely affecting the energy picture of the nation. But then, every statement has a counter statement. It can be argued that we have abundant coal reserves- the fifth largest in the world. So why bother? Even though we have large resources of coal, it needs to be imported from countries like Australia, Indonesia, etc. This adds to the cost of coal and ultimately to the cost of energy. The cost of transportation, processing, storage, handling causes the economic efficiency of coal to drop down to as low as 9%. That is why it is necessary to consider options to replace coal with a source available abundantly and economically. The very obvious answer to this situation is the ‘Sun’. But the solar energy contributes only 3% to fulfill the energy demand in the country. As on 31st December, 2016, the cumulative installed capacity of the solar grid of the country was 9012.66 MW. It is targeted to reach 100 GW of solar capacity by 2020. The real question is whether the solar energy is sufficient to supply ‘all’ the energy requirements of the country?? The answer surprisingly is ‘YES’!! Now there can be another question, the sun is available abundantly, so what is the surprise in this? The anticipated energy requirement of India is about 1100000000000 kWhr/year. According to researches India receives insolation of 5-7 kWhr/m2 per day. What exactly is insolation? In the simplest words, insolation is the integrated energy received from solar radiation per unit area. Now, let us calculate how much area of land will be required to accumulate total radiations to satisfy the energy requirement. Consider efficiency of generation be approximated as 10*%. This efficiency will include the efficiency of panels, inverters, cables, etc. i.e. 0.15% of the total land area available. If such a small amount of landmass available in the country is required to fulfill all the energy needs, solar energy can pave a way for the nation to become completely energy dependent. This will greatly reduce the percentage of foreign exchange that we spend in buying energy. So profitable isn’t it? Now where can be the solar plants be set up? The potential areas where the solar plants can be set up can be determined from the map showing ‘Direct Solar Irradiance’. 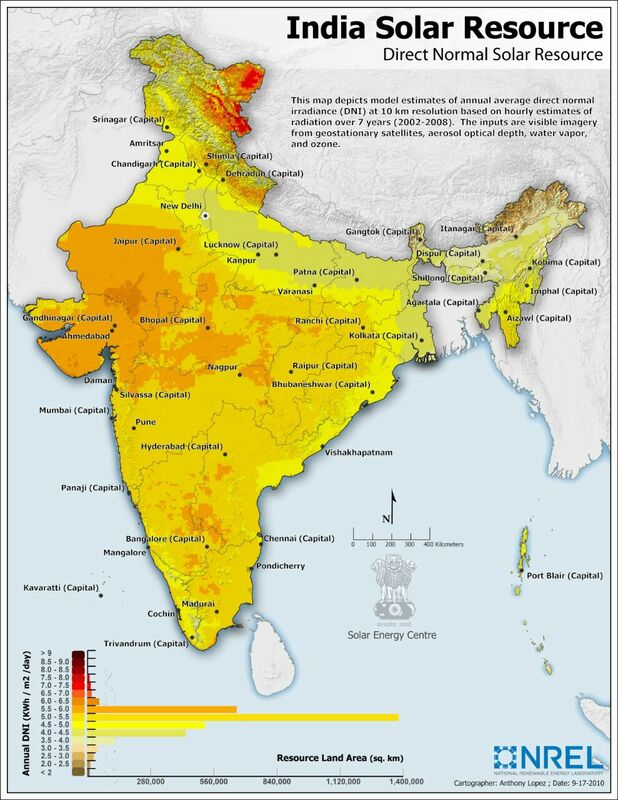 The following map shows ‘Direct Solar Irradiance falling on Indian landmass. A major portion of the country’s land is plateau region and receives 5.5 kWhr/m2 of solar radiation. The various color codes in the map are analogous to the amount of solar radiation received in various regions of the nation. The largest concentration of radiation 7-9 kWhr/m2 is received in the colder northern regions of the nation. Also, regions in the west, parts of Rajasthan and Gujarat also have potential of installing solar plants. Solar energy is already enhancing the energy consumption in the country, also in a ‘healthier’ way. Solar products increasingly help to meet the energy needs in rural areas. By the end of 2015, about 1 million solar lamps were sold in the rural areas, greatly reducing the need for kerosene. This program was undertaken under the ‘SoULS’ initiative with slogan ‘Right to Light’. Also, a cumulative total of 30256 solar powered water pumps for agriculture and drinking water had been installed. 118700 solar home lighting systems and 46555 street lightening systems were installed and about 1400000 solar cookers were distributed. Aayesha Inamdar - Electrical Engineer. Masters in Electrical Engineering student specializing in Electrical Power Systems. Ardent reader and aspiring writer.